Although it is the tiger that attracts most visitors to the Sunderbans National Park, it biological diversity is one of the main reasons why UNESCO ascribed it as a World Heritage Site in 1987. The Sunderbans, which takes its name from the once abundant sundari trees, sprawls over a huge deltaic zone – an archipelago of mangrove-riddled islands and a network of tidal rivers and creeks. 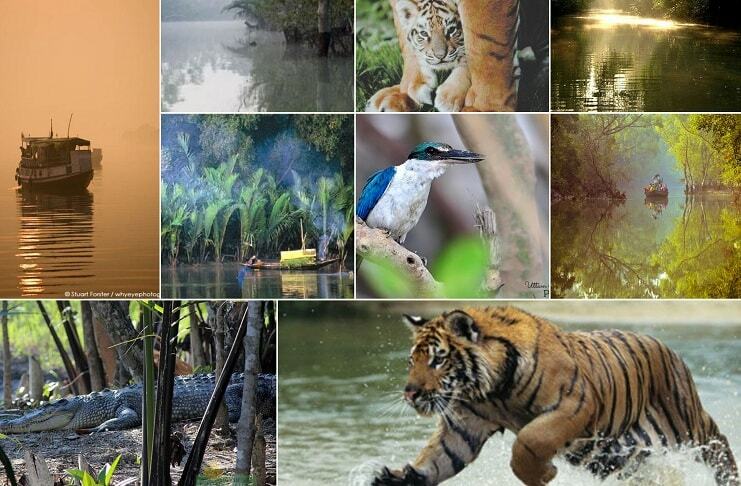 India shares the Sundarbans with Bangladesh, and together it is the largest mangrove forest in the world. Of the 4,264 sq. km of mangrove forest that lies in India (wholly in West Bengal), 2,585 sq. km has been earmarked as the tiger reserve under Project Tiger. Apart from this, the Sunderbans is a National Park (1984) and a Biosphere Reserve (1989). Today, there are several entry points into the Sundarbans, lying within a radius of 45 km to 100 km, south and south-east of Kolkata. But whether you enter through Canning (the nearest suburban railway station) or any other town, ultimately you have to take the water way. Although there is limited accommodation on land (a state tourism lodge and a handful of privately run resort-style units), one can also opt for launch cruises run by the State Tourism Department and private operators. The Sunderbans is very different from any other forest in India. Apart from the inhabited islands, tourists are allowed to disembark only at specific islands, albeit with permission and accompanied by armed forest guards, to visit the watch towers. From the watch tower, people get a closer look at the thick forest canopy. It is not difficult to catch a sight of spotted deer, wild boar or monkeys near the waterholes but it is well-nigh impossible to spot a tiger. The Sajnekhali Island has a watch tower and a Mangrove Interpretation Center where visitors can learn about the unique biodiversity of the region. A typical trip to the Sunderbans involves an exciting cruise along tidal rivers like the Matla or the numerous creeks. Cormorants, curlews, fishing eagle or kingfishers keep you company from time to time. The log on the mudflat that you had ignored could just be a crocodile! Tides are a common feature here and the animals have also learned to adjust accordingly. The best time to visit Sunderbans is between November and March. Most package tour operators take care of the compulsory entry permits and forest guard arrangements. The modest government tourist lodge (in Sajnekhali Island) and a few private accommodation options are heavily booked during the peak tourist season, so advance planning is advisable. Don’t forget to carry essentials such as a torch and batteries, sunglasses, umbrella, insect/mosquito repellents and personal medicine.